I don’t know about you, but I have an entire shelf in my writing studio packed with “half-read” books on craft. I buy them with the best intentions, but here’s what actually happens: I start the book, read four or five or six chapters, do many of the suggested exercises, feel inspired, and go back to revising my novel. I tell myself I’ll revisit the “craft book,” but rarely do. Until now. A few weeks ago, I took Donald Maass’s WRITING THE BREAKOUT NOVEL WORKBOOK back off the shelf and flipped it open. And believe it or not, I read every single page and completed every single exercise. No joke. But why this book? And why now?” Here’s what I think happened. 1. My novel was ready for this level of revision. It had been edited and revised many times, but was missing the icing on the cake – the extra pizzazz and sparkle needed to draw my readers in. 2. WRITING THE BREAKOUT NOVEL WORKBOOK is a workbook and invites you to write inside it. It has tons of blank spaces and lines. The book speaks to you and says, “Hey, let’s think more deeply about your characters, your plot, your setting. Go ahead – do it. Right now. And I did. I sat at my desk, pen in hand, and poured through the exercises. I changed the motivations of secondary characters, made my protagonist go to her “third” level of emotion, and amped up the action wherever I could. But the most valuable suggestion came at the end of the workbook where I was challenged to create emotional tension on every page. This was the most elaborate exercise of all and could not be done in the workbook. I had to work with the actual manuscript and do the editing, one page at a time, out of order. One writing friend said she printed her manuscript, threw the pages on the floor, and gathered them up in a mishmash. This seemed a bit messy to me, so I switched on the teacher part of my brain and came up with a plan. I would make a make a graph! 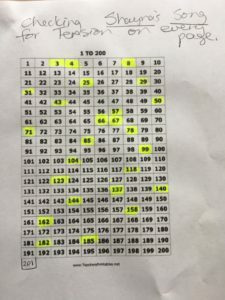 I went online, printed out a rectangular chart of squares numbered 1-200, and got to work. 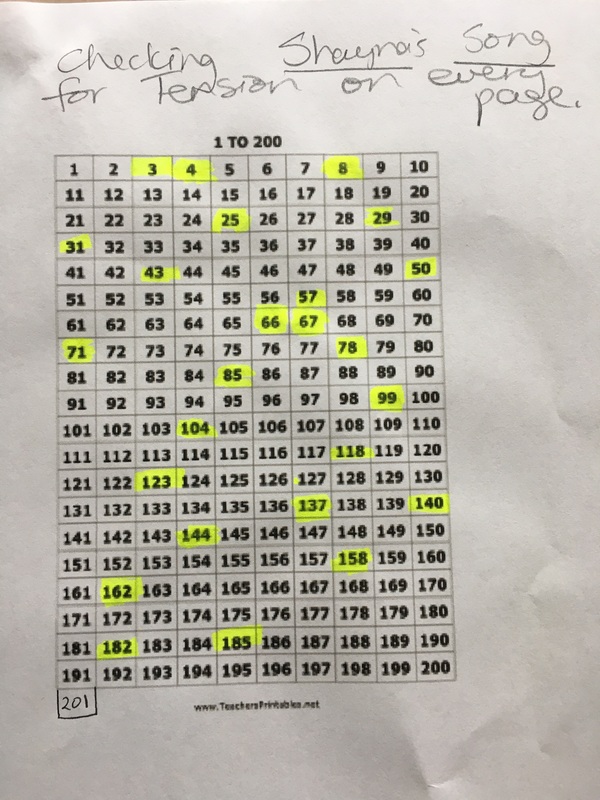 Next, I took my yellow highlighter and colored in a square at random – 104. Then I opened my computer, pulled up my novel, and scrolled down to that exact page. I read slowly and critically, editing specifically for micro-tension. When I was happy with the revision, I grabbed my marker and found another square­ – 185- and repeated the process. Then I picked 36 and went to a totally different place in the book. It was like playing bingo or doing a jigsaw puzzle. And here’s the exciting part. Along with editing for tension, I was able to accomplish a number of other editing tasks. I shortened sentences, got rid of unnecessary dialogue, found (and deleted) repetitive words, increased my use of metaphors and corrected punctuation. I also found a number of typos – ugh! It was exhilarating, despite a few snafus. The main one was page changes. After editing out complete paragraphs, or even a sentence or two, my page numbers were no longer accurate. I would go to page 32 and discover that it now contained the content from page 33, which had already been edited. Another issue was stopping myself from going on to the next page. It was so tempting to finish a chapter! But jumping around in your story is key with this exercise. It makes you hone in on a scene and make it the best it can be. Do you have books on craft collecting dust on your shelves? Take one off the shelf and get reading. Do it. Right now! Have you edited for tension on every page? If so, what were your strategies, pitfalls, and takeaways? Fabulous post! I can totally relate to unread craft books. But good for you for committing and taking your novel to the next level! I’m impressed and inspired. Thanks so much for sharing. Your experience really got me excited about your work and mine.